The Thirteen Best Sketches Featuring THE HONEYMOONERS (1954-1957) | THAT'S ENTERTAINMENT! Welcome to another Situation Comedy Tuesday! Today we’re continuing with The Honeymooners, highlighting the best sketches from the 1954-1955 and 1956-1957 seasons of CBS’s The Jackie Gleason Show. 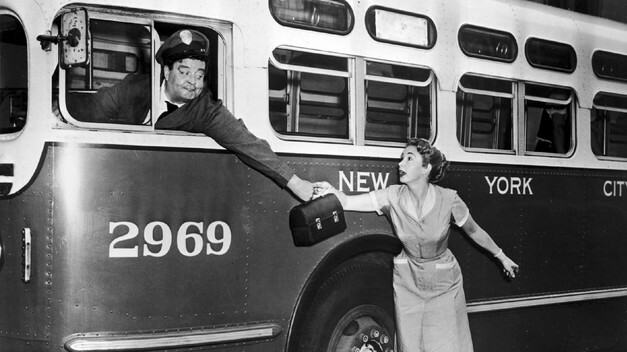 Ralph Kramden is a New York bus driver who dreams of a better life. With his eccentric good friend, Ed Norton, the sewer worker, Ralph constantly finds himself involved in a bevy of crackpot schemes. All the while, his exasperated wife, Alice, is there to bring him down to earth (or pick him up, if he beats her to it). For as much as they fight, even big-mouth Ralph knows that, his baby, she’s the greatest. The Honeymooners stars JACKIE GLEASON as Ralph Kramden, ART CARNEY as Ed Norton, AUDREY MEADOWS as Alice Kramden, and JOYCE RANDOLPH as Trixie Norton. The Honeymooners had an interesting history. It originally began as a sketch on the 1951-1952 season of DuMont’s Cavalcade of Stars. 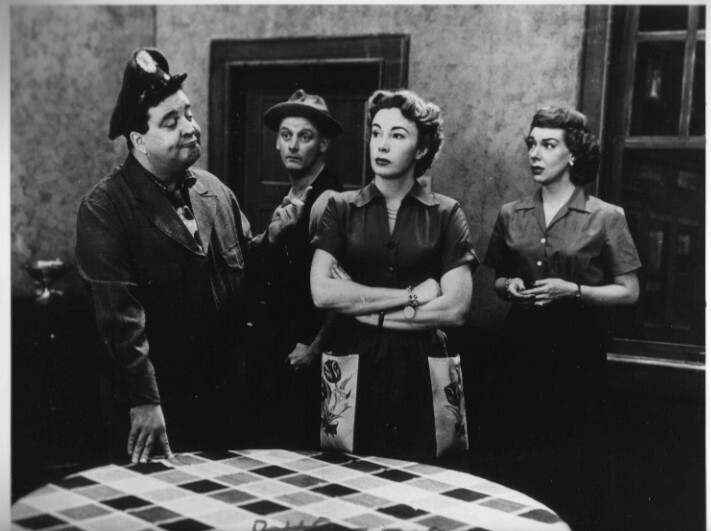 Most sketches were under ten minutes and featured the iconic foursome minus Audrey Meadows, whose role in this first year was played by Pert Kelton. For the following season, Jackie Gleason moved to CBS for The Jackie Gleason Show, and The Honeymooners went with him. Kelton was replaced by Meadows and the sketches played on the Gleason Show for the next three years (until the summer of 1955). By then the sketches had stretched to about 40 minutes in length and were undoubtedly the highlight of every show. 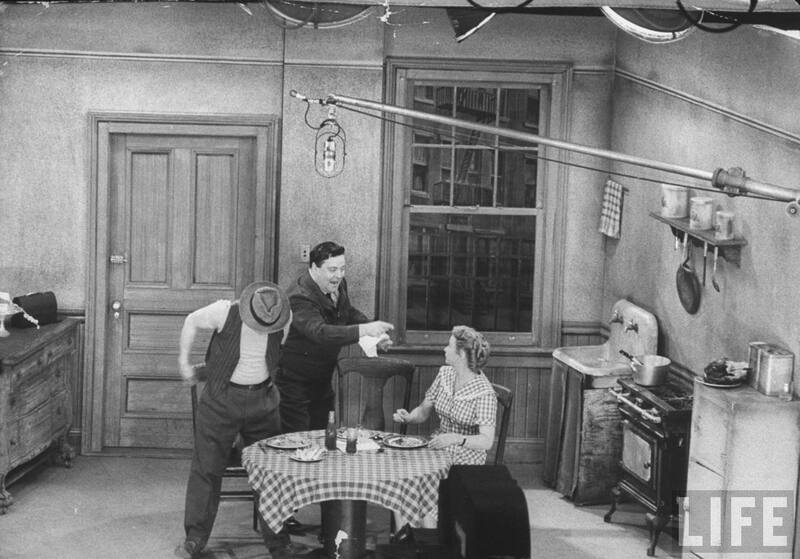 For that reason, Gleason dispensed with his variety show for the 1955-1956 season, and instead committed to a single year of filmed half-hour episodes of The Honeymooners. These episodes, which for a while were the only ones seen in syndication, became known as “The Classic 39.” After this initial season was completed, Gleason declined to continue with The Honeymooners, opting instead to return for another year of The Jackie Gleason Show. Once again, The Honeymooners went with him. But as Gleason’s show ended in 1957, so did The Honeymooners… for the time being. Over the next two decades, Gleason brought back the Kramdens and Nortons in a slew of skectches, specials, and even a new series. But without Meadows and Randolph, the series was never quite the same. The best Honeymooners stuff comes from the ’50s and that’s what I’ll be covering here on That’s Entertainment! Last week we covered the best Honeymooners sketches from its year on Cavalcade of Stars (1951-1952) and its first two seasons on The Jackie Gleason Show (1952-1953 & 1953-1954). Today’s post highlights the best sketches from the 1954-1955 and 1956-1957 seasons of the Gleason Show. The 1955-1956 season was the year of the filmed and syndicated “Classic 39,” which was covered here two weeks ago. The “Classic 39” was for decades the only Honeymooners stuff regularly seen and is often considered one of the greatest sitcom seasons of all time. I’m here to tell you that the 1954-1955 sketches are just as good as the “Classic 39!” So, here is your guide to the best sketches from that season, as well as the season of The Jackie Gleason Show that followed the “Classic 39.” The 1956-1957 season does not have as many excellent sketches, and the music-heavy eight-episode trip to Europe that aired in early 1957 is not a favorite of mine. However, it’s still Gleason, Carney, Meadows, and Randolph. And that means it’s pretty darn good. This post shall serve as a reference for anyone who has access to the 100+ lost episodes, but doesn’t know where to start. For interested newbies, the 1954-1955 season is outstanding, but I’d recommend checking out my post on the “Classic 39” and getting yourself hooked from there! Ralph is selected to appear on a live commercial for “Choosy Chews” candy bars, but he develops a bad toothache the night before the broadcast. The opening sketch of the season shows an incredible rise in quality. These next 27 shows are excellent, and this first one kicks the year off nicely. Ralph’s excitement over appearing in a commercial is marred by a toothache that, of course, ruins the spot. This one runs under 37 minutes. When Ralph finds a love letter and assumes Alice is stepping out with another man. So he takes the letter down to a handwriting expert. This hilarious sketch was later remade in 1956. Alice finds one of Ed’s old love letters to Trixie when she borrows the latter’s cookbook. Ralph finds the letter and is determined to find out who has been writing to his wife. He takes it to a handwriting expert who easily figures out to whom the handwriting belongs. Hijinks ensue! This wonderful sketch runs less than 39 minutes. Ralph and Alice are contestants on a TV game show, but Ralph almost misses the show when his sister-in-law goes into labor. This unique premise is probably a touch better on paper than in execution, but as we know from “The $99,000 Answer,” Ralph on a game show is a recipe for hilarity. This one runs about 32:30. Ralph treats Alice and the Nortons to the movies, where Ed wins a new TV set in a raffle. A dispute over ownership of the set brings the Kramdens and Nortons to court. Here is one of the best Honeymooners sketches/episodes of all time. I Love Lucy did a similar episode where the two couples sued each other over a television set, but I think this one is actually funnier. I give it automatic bonus points for giving Trixie some of the most she’s ever had to do — both in the pool hall and on the stand. This is a funny and highly recommended episode. It runs under 35 minutes. Ralph asks a fellow Raccoon to hypnotize Alice into revealing where her secret stash of money is. Scheming Ralph is generally hilarious and this is no exception. Even the premise is funny: Ralph gets one of his lodge buddies to hypnotize Alice into revealing where she’s hidden her secret stash of cash. Of course, Alice finds out beforehand and turns the tables on the unknowing Ralph. Another running bit is the hypnotic trigger that plagues Ralph and Ed throughout. This funny sketch runs under 39 minutes. A psychiatrist tells Ralph that the best cure for his frayed nerves would be to sever his relationship with Norton. This popular sketch is one of the best Ralph/Ed “buddy” episodes. Ralph learns from a psychiatrist that, for the sake of his nerves, he should stop seeing Norton. Now how does he tell Norton? Ralph decides to write him a letter. He never sends it, but Ed sees the letter anyway and assumes that Ralph is going to commit suicide. Again, hijinks ensue. This sketch runs about 39:30. Ralph loses sleep trying to patch up an argument between Trixie and Ed. One of the reasons I love The Honeymooners is because it’s so theatrical — many sketches take place in realtime on limited sets. Just like a stage play. This one shows the theatricality best and features Gleason at his most hysterical. This highly recommended sketch runs over 37 minutes. The Kramdens and Nortons buy an apartment together and drive each other crazy. A lot of ’50s sitcoms have predictable stories, and this concept is nothing incredibly fresh. But Gleason and crew rarely fail to provide laughs — especially when they’re angry at each other. This is a laugh riot and runs just under 38 minutes. Ralph must lose weight in order to pass a bus company physical. This is an expanded version of a 1953 sketch. That one was funny; this one’s even funnier. Crazed Ralph launching into the food is a site to behold. (Hey, I can’t throw stones though.) Gleason is just outstanding. He elevates every script and every scene. This is a funny show, but that moment is killer. This one also runs just under 38 minutes. The wives demand that the boys spend more time with them, so Ralph and Norton scheme to exhaust them with a wild night on the town. Another boys against the girls episode! The wives demand that the boys take them places in the evening, so Ralph and Norton plan to tire them out. As can be expected, it’s the boys that get tired first and the audience is rewarded to some well done physical bits in the diner involving two tired husbands. This one runs under 37 minutes. Ralph and Norton campaign for a local politician, but Alice intends to vote for his opponent. This is a comparatively short sketch running under 14 minutes. (With the return of the variety series, the sketches initially began at a more modest length before eventually returning to dominate the show.) The conflict between Ralph and Alice over politics is new, funny, and welcome. Ralph has been working the night shift and has difficulty sleeping amidst the daytime noises of the neighborhood. This one runs about 15:30, and that’s the perfect length for a sketch as theatrical as this. With a simple premise and a hilarious Gleason, what can I say? It’s excellent comedy. Ralph boasts that he’s friends with Jackie Gleason and now must somehow book Gleason for the upcoming Raccoon dance. We don’t always see ’50s sitcoms with self-awareness, so this is a delight. The foursome play the characters AND THEMSELVES after Ralph has promised his lodge buddies that he’ll get Gleason to appear at their dance. The best moment occurs when Ed tells Ralph that Art Carney is much funnier than Jackie Gleason. Truly hilarious. This one runs about 39:30. Come back next Tuesday as I cover the best Season One episodes of TV’s Our Miss Brooks! And remember to tune in tomorrow for a new Wildcard Wednesday post! Pingback: Jackson Introduces The MVE Awards | THAT'S ENTERTAINMENT! I love the George Petrie line in “Catch a Star” when he tells Kramden and Norton that he watches “The Perry Como Show” instead of “The Jackie Gleason Show” — made even funnier by the fact that the former was beating the latter in the ratings. Hi, TV Talking Heads! Thanks for reading and commenting. Yep, ‘tis a very metatheatrical outing.